Are You Looking for the Keys to Break Through your Limitations And Develop the Self Confidence to Master your Life and Dreams? Imagine exuding total self-confidence, moving beyond your fears, insecurities and worries? You could so easily be attracting the best people and circumstances into your life, and attracting all the abundance you can handle. If you are not confident in yourself, in your strengths and abilities, you will not approach your goals and dreams with confidence, and will be forever trying to achieve them. Self Confidence is not just a quality that will benefit the insecure or shy person. Anybody and everybody can do with increasing their levels of self confidence. And this is one of the key factors to attracting the life of your dreams. Time to kick it up a notch! This high energy course is designed to skyrocket your self confidence and inspire you to boost your life towards success! Authentic fears and inauthentic fears. How we go from self love at birth, to the point of losing it. How we go after achieving to command some love and attention. The number 1 best way to always have love in your life. How our subconscious expectations manifest in our reality. Why it’s so important to have self confidence. The power of loving yourself completely. The ‘need’ for approval, and how this holds us back. Why and how anger, resentment and non-forgiveness holds you back. How we distort life experiences, and often misinterpret them. The # 1 key to being happy. Mark's own lack of confidence during his adolescent years kept him hiding out from society for 8 years. He basically hated himself and the whole world. He went on to become a security guard in Englandand did all he could to alienate himself from anybody and everybody. Then he started relying on sleeping pills to get some rest from his tortured mind and gradually found he needed more and more, until one day he took one too many! Then and there he decided with the utmost conviction: “I’m going to learn everything there is to learn about happiness”. He spent years studying happiness, and modelling happy people. And he spent years studying prosperity, and modelling prosperity. Through this process he came to know Self Love and gain MASSIVE SELF CONFIDENCE. Today Mark is a hugely successful entrepreneur. He earns well in excess of £100,000 each month, and runs a seminar company teaching others what he has learnt. Mark is dedicated to sharing the secrets of financial freedom and wealth creation, and raising our awareness of the hidden principles of life. 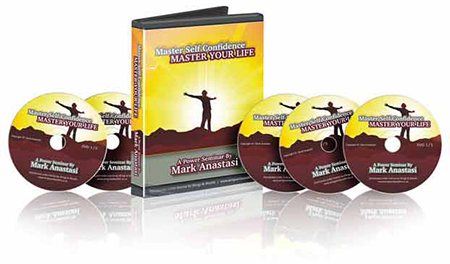 "Today I had the pleasure of 'attending' the highly enjoyable and informative 5 DVD seminar called Master Self Confidence Master Your Life by Mark Anastasi right in the comfort of my own home. I liked Anastasi. He was a fun, enthusiastic and passionate motivator and teacher. He shared his story and he shared the ways that he used to transform and develop himself. He is a shining example of a transformed personality. 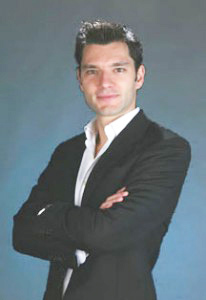 He is young, energetic, intelligent, super confident and an excellent teacher of ways to success and confidence. I found the 5 hours or so of presentation enlightening and certainly interesting. Anastasi draws on a variety of disciplines and creates a holistic and clear outline to follow. I think this is an excellent resource. Anastasi teaches affirmation, visualization, seeding and several other mind power techniques. He demonstrates how to use the subconscious mind to solve problems and he presents many practical and extremely useful tools and techniques for creating success and confidence. He also has strategies for dealing with challenges. Overall this seminar was a wonderful and very positive experience." "As I continued to watch and listen, what is clearly apparent is that Mark 'walks his talk' and for me this is enormously powerful. My feeling is that others may perhaps relate to Mark more easily than other more experienced speakers who at times appear to come from a place of already 'having it all'. It's Mark's 'down to earth' approach which holds huge appeal. I have huge respect and admiration for what he has achieved and is on his way to achieving ... he truly is an inspiration and as one of the ladies commented ... he is definitely 'going places'. In his one day seminar "Master Self Confidence Master your Life", which is packed with nuggets of wisdom, examples of life experience, and easy to apply tools and techniques, Mark passionately shares how you can 'turn your life around' too. 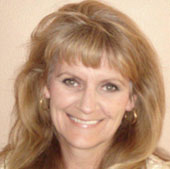 An energetic seminar that inspires you to take action and one that you won't want to miss!"